Yes it's the start of another year, and here's to hoping it's a good one for all. I've been meaning to post but haven't quite found the time to be honest, I've been busy making plans for the year, and I've also started on the allotment already, plenty to do there this year, I was mainly concerned with getting some kind of compost bin going and clearing the top section of the plot which we left last year. 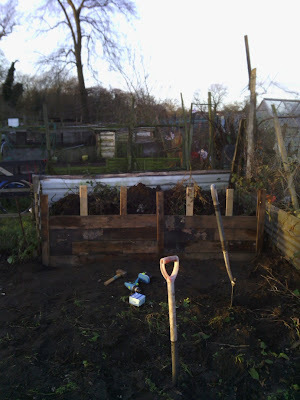 So I set out a few mornings ago with a load of wood and some other stuff and finally got the compost pile in order, we just dumped all the stuff we'd cleared last year in a pile, so now it has a nice wooden front to it, which can be taken out so the compost can be turned, unfortunately I didn't take quite enough wood with me so on the next visit I need to add a little to it. My son is hoping some grass snakes might make a nest in it. Other than the compost bin it was the usual business of clearing, luckily it wasn't that bad, I had expected things to be a little wilder than they were because it's been very mild weather wise. I also made a start on re-locating the many raspberry plants we seem to have inherited, perhaps not the the best time to be doing this, but never mind. Not the greatest of pictures. My lovely wife got me a book on allotment gardening for Christmas, which I've been reading, it's a very useful book and has some great ideas for growing different plants in different ways, I'm all for experimenting, my advice to anyone who wants or has an allotment and isn't used to getting the best out of one is get a good book or two, they'll come in very handy. 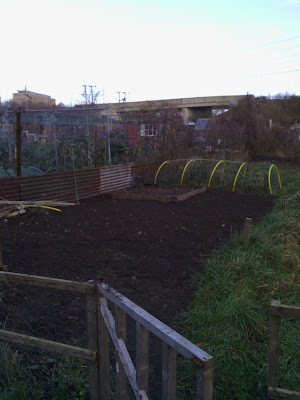 The allotment once I'd finished, there's something deeply pleasing about newly dug earth. I'll be staying tuned to see how you get on with the chicken coop. I'm planning to make one too, no idea where to start, yet! Recently we got a proper one off freecycle, currently procrastinating about making/acquiring a run and chooks.